Maybe you have chairs. We have pews. In the sanctuary. Maybe your rows are wide allowing easy access, to enter or leave. Our rows are narrow. Once you get inside, you might as well get comfortable. O Soul Within, where do you sit? I see you, you know. You sit in the far back like a good back-row Baptist. And you grasp the pew’s edge like your life depends on it. Beads of perspiration overtake you when you have to release your good grip. I see you. And your heart feels a little put-out when you have to bend your legs for others to move past you, to the inside. I know, you had gotten comfortable, seat warmed, you didn’t want your pants to twist. I know it. I see you. O Soul Within, are you in the way? And as I became self-aware, from my outside seat on the back row, in the balcony, I saw all the edges filled and the middle left sparsely occupied. The heart of the sanctuary seemed empty. My thoughts hovered over it for a time. It’s easier to sit on the outside, isn’t it, O Soul Within? It calls us to bend a bit, for others to pass through, and sometimes our toes get stepped on. But we can come and go as we please. With ease. We can slip out to the bathroom. We can bolt. We don’t get trapped. If some can’t sit on the outside, they’ll get up and go. And that could possibly require you to bend again. O Soul Within, you feel conviction, don’t you? Moving into the heart of the sanctuary is a bit inconvenient. We have to step over people, be cautious not to step on toes. We accept the risk of getting trapped there. Why are we afraid to move in? To move close? Are we afraid to come alongside other Believers? Are we afraid for others to know us too well? Really know us. Are we afraid for others to know when we’re absent? Or present? Are we afraid of what it might demand of us? How close are you willing to get, O Soul Within? Are we outsiders or insiders? O Soul Within, Sunday morning is often a reflection of you—who you are. Yeah, your very soul. It stings, doesn’t it? Just let it sting. Because if you’d just move in—sit in the seat prepared for you, live the life God called you to—you wouldn’t be called to bend, or move, or feel the press of your toes, and there’d be room for others to conveniently move in, too. When you move, your children move. The heart of the sanctuary would be overflowing. Because where two or more or gathered, the Lord is doubly attractive. And visitors or late-arrivals would always have a place, enough space. Yeah, it’s sweet to see that those on the pew rose to the occasion. And it’s doubly sweeter to see the rows become endless, without edges, the growth so exponential that no one can fall off and hit the ground. Can you just see it? And the view will always be perfect. Because the view is Jesus. The inside more crowded than the outside—what a concept. O Soul Within, peel away from the edge. Don’t be afraid to move into the heart of the sanctuary, to come alongside fellow Believers, because that’s where you’ll meet God. On the inside. In the heart. The inner circle. Have you ever felt God calling you to more? Relinquishing your very self? Have you had to push past fear, like me? Shelli, I'm one of those people who'd love to sit at the back, but those seats are already taken. I've gotten used to the middle. And you know what? I'm starting to like it. That's where I'm supposed to be. Our church has pews too, and I'm curious what's going to happen during our renovation when we have to have our service in the gym temporarily. Wow. It's going to shake things up. And yes, you are definitely supposed to be in the middle … doing what God has called you to. Sometimes it's scary … but He's always with us. I have to imagine that where we choose to sit says something about us. I find it odd that when my wife and I go to a movie theater we always try to sit middle center, but at church we always sit middle left. 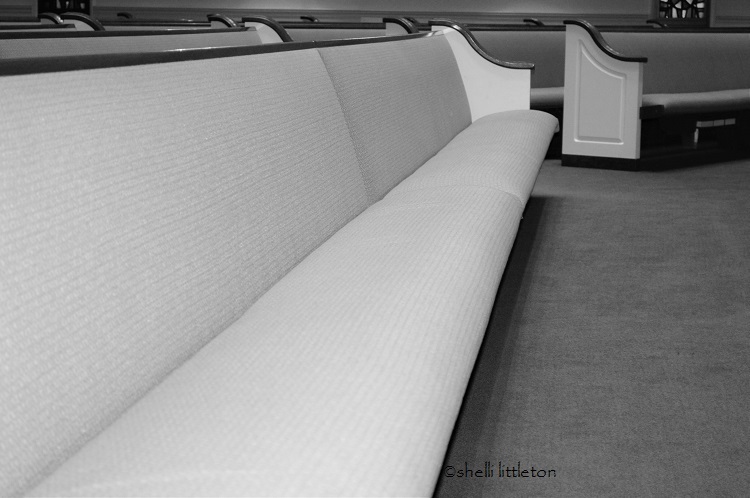 I've also noticed in church my seating preference has changed over the years; as my confidence in Christ grew I moved closer to the main body instead of looking for the least occupied section. I think as we become more confident in our faith we also become more uninhibited and begin to live it out loud. It is a beautiful sight to see believers growing and moving towards the heart of the sanctuary. 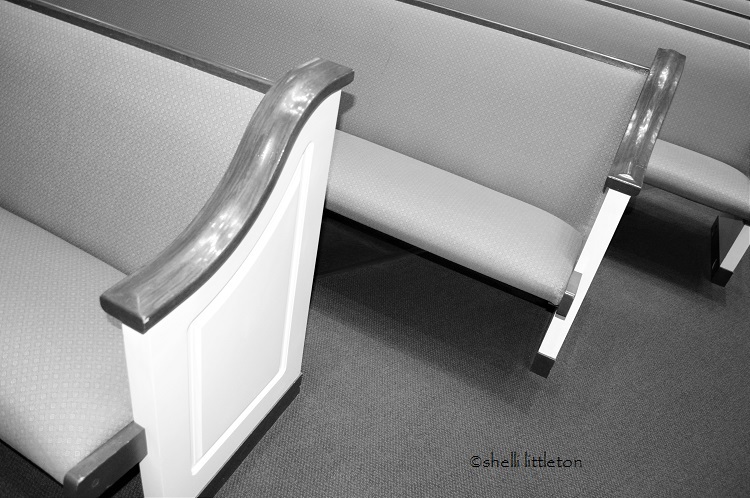 Every church seems to have them: assigned seats that were never assigned. Jeanne … you are precious. 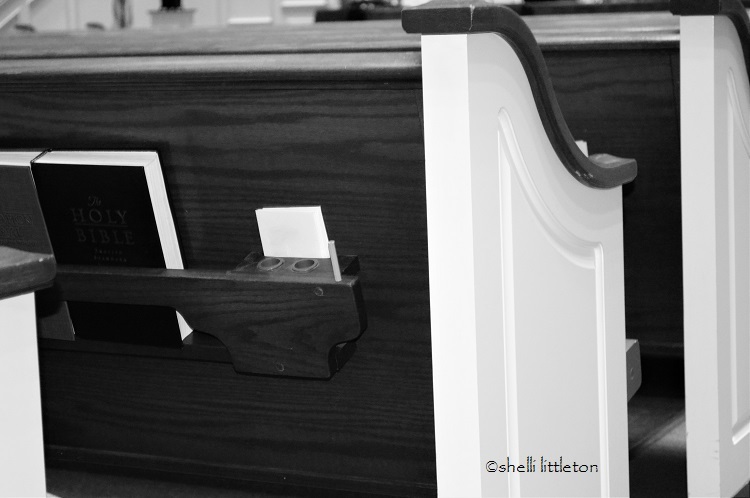 Yes, this post about pews really had not much at all to do with pews. And I felt like an idiot for writing about it … to get to the heart of the message. I almost wanted to hide it … and you tell me it's beautiful. I needed that. Gene … “begin to live it out loud” … yes. Uninhibited … yes. That's exactly it. Loved this post, my friend. Great post, beautiful pictures, and I am sorry it took so long for me to get here. I'm not comfortable in crowds, so I tend to hang back, and will often stand or sit along the side of the sanctuary, on the floor…or at least I used to, when I could still make it to church. There's a saying from George Orwell, to the effect that good people sleep soundly in their beds at night because rough men stand ready in the darkness to do violence on their behalf. I have always been an outsider; this is God's place for me, and I am content with it. LOVED your flash fiction entry for Splickety! I love that saying, Andrew. I know you have to be careful. I just read Cathy West's Yesterday's Tomorrow … just gave me another glimpse of what people with PTSD live with. And outsider? I don't know if I'd agree with that. You are an insider to all that need you. Yes, you are right where you need to be and doing what God has called you to.